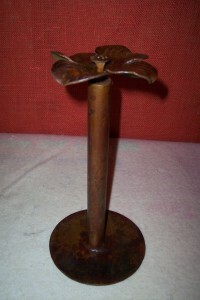 "Forging Iron into Black Gold Treasures"
Dogwood flower finial removable from a 7/8 inch diameter stand to easily replace the towel roll. A heavy steel base keeps from tipping the stand while tearing off the towels. Natural golden brown patina with darker highlights created by a special oxidation process and then sealed with a clear satin finish to preserve the beauty for a lifetime.